Bleak is the perfect word to describe David Michôd's latest feature The Rover. Part Mad Max and part Unforgiven, it is a distinctly desolate combination of dystopian science fiction and revisionist western. Its execution is impressively ambitious and its atmosphere is so dense you'd need more than a knife to cut it, but its hopeless outlook left me too cold to count this raw examination of human nature among my favorites of the year. Eric (Guy Pearce) is a man with nothing left to live for except his car, so when a band of thugs steal it he becomes engulfed with inconsolable fury which slowly bubbles up from beneath the surface of his thick, grizzly exterior. He pursues the thieves by all conceivable means, but when they start to slip through his fingers he must rely on the witless young Ray (Robert Pattinson), the brother of one of the outlaws. The characters are as stark as the world they inhabit, and both Pearce and Pattinson manage that admirable feat of doing quite a lot with very little. Eric is the silent, stoic, Clint Eastwood-type cowboy, and Pearce conveys immense existential despair with the simplest of expressions. Ray on the other hand is talkative and meek, and Pattinson plays him with a warmth and innocence that significantly livens the cold, dark world he inhabits. The score is a fantastic blend of atonal noises reminiscent of the work of popular cinematic newcomers like Johnny Greenwood or Trent Reznor. It's a hard act to pull off without losing the atmosphere entirely, and Antony Partos succeeds effortlessly. The chaotic percussion and lack of melody enhance the deserted landscapes, the forlorn atmosphere, and the characters' evaporating humanity. The reason I can't completely get behind this creative independent production is that it takes itself too seriously. It relies too heavily on men threatening other men by pointing guns at them or grabbing their shirt collars and demanding various things. The despairing bleakness of the film never lets up, and while this hammers home its theme of our lack of humanity outside social conventions, it leaves little room for audiences to find enjoyment of their own. It might be smarter than the typical post-apocalyptic blockbuster, but it's also more dreary and dull. 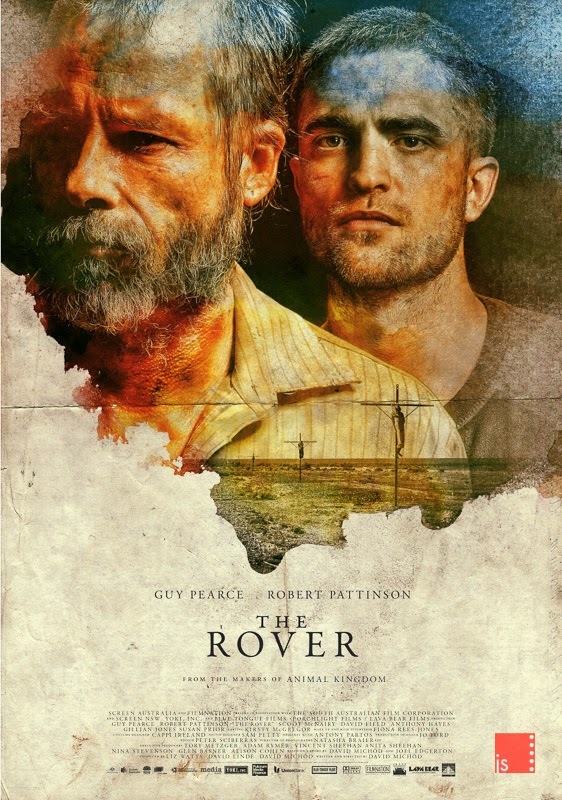 Overall, The Rover is an admirably striking creation which is easy to appreciate but a bit too hard to enjoy. It's one of the year's most impressive films, but its occasional tediousness makes it also one of the most inaccessible. If you like subdued character studies then this may become a fast favorite. For me it's too drab to stand out on its own, but it deserves all the praise it gets for doing with fewer resources more than most modern genre films.